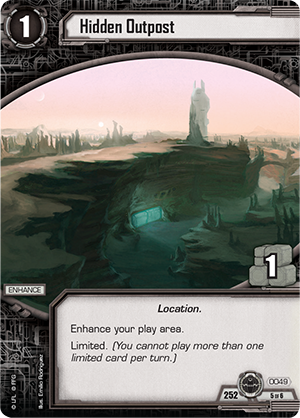 As you gather your team of Specter units, you’ll be bridging the gaps between affiliations, bringing different units together around a common goal—removing your opponent’s options by stripping cards from his hand. Still, these freedom fighters can’t just exist in the ether of space. They need a home and a base of operations, a place where they can hide from the Empire and plan their next move. In short, they need the Ghost (Power of the Force, 2023). 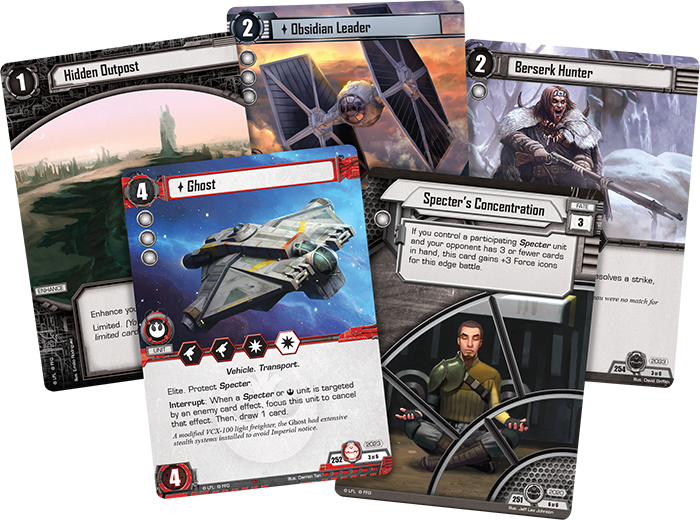 The Ghost enters Star Wars: The Card Game for the first time as a powerful Vehicle unit, more than capable of fighting down the Empire’s starfighters in pitched battle. More important than its combat icons, however, are the Ghost’s abilities to protect the Lothal rebels from any Imperial entanglements. First, the Ghost bears the protect Specter keyword, giving you an extra buffer to keep your team from being destroyed in battle, no matter the mission. You’ll also be able to account for any unforeseen dangers by sending the Ghost swooping in. 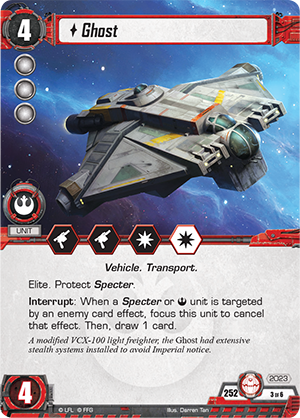 Whenever a Specter or Rebel Alliance unit is targeted by an enemy card effect, you can focus the Ghost to cancel that effect and draw a card! The Ghost would seem out of place without its accompanying starfighter, cleverly hidden on the back of the Ghost itself. Although the Phantom (Power of the Force, 2024) may not pack the same punch as the Ghost, it’s no less important for protecting your units. In fact, when a friendly Specter or Character unit would be destroyed or captured, you can instead sacrifice the Phantom and remove all damage from the imperiled unit—giving you a way to dodge a potentially inevitable defeat. And of course, the Ghost wouldn’t be anywhere near as threatening without the masterful touch of its pilot, Hera Syndulla (Power of the Force, 2022). Like the ship she flies, Hera Syndulla can hold her own in a fight, but she’s more remarkable because of the ways that she supports her friends. To start, every other friendly Specter and neutral unit gains an additional unit damage, making all of them more dangerous in a fight. 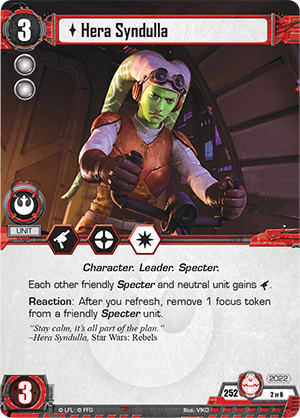 Then, if that weren’t enough, Hera lets you remove a focus token from a friendly Specter unit after you refresh, giving you even more immunity to the despicable tactics of the dark side. Once you’ve combined Hera and her ships with the rest of the Specter team, there’s just two things you need: a mission to complete and the resources to do it. Fortunately, this objective set has both of those covered. 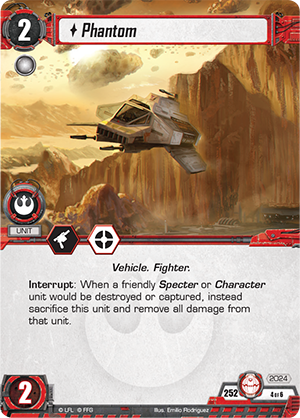 Between a Hidden Outpost (Power of the Force, 49) and the Haunting the Empire (Power of the Force, 2021) objective, you shouldn’t have any problem paying for more units to join your growing rebellion. And as for a mission, what’s better than a Call to Action (Power of the Force, 2025)? 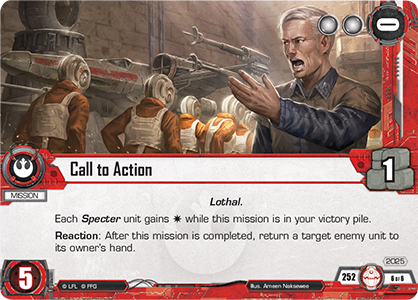 Call to Action is a new mission card, similar to the ones first introduced in the Endor cycle, and like those previous missions, it allows you to play this card as an objective under your opponent’s control. Destroying it counts as destroying an objective, and it also offers a variety of other benefits. For instance, when you complete the Call to Action mission, you can immediately return a target enemy unit to its owner’s hand. More permanently, however, each Specter unit gains a blast damage while Call to Action is in your victory pile! 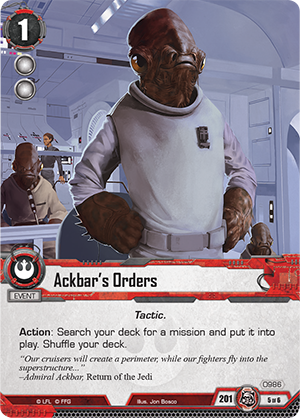 You may even use Ackbar's Orders (So Be It, 986) to search for this mission, ensuring that you get the chance to complete it and muster a full offensive as soon as possible. 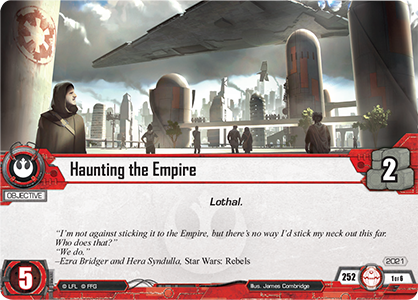 The Lothal rebels are ready to bring the fight to the Empire—the only question is whether or not you’re going to join them. 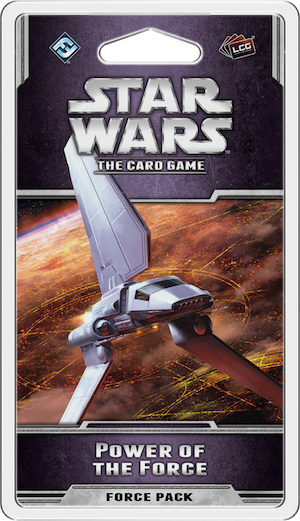 Step into the rivalries of the Opposition cycle and look for Power of the Force at your local retailer in the first quarter of 2016!